Regular bras can be a straight up pain in the behind, and that’s never more evident than when you’re doing any sort of exercise. If you want to exercise regularly without a lot of pain, you need sports bras, the best sports bras you can find. However, finding the right one is not easy and even a sports bra that would be fine for one type of exercise, like yoga, might be horrible for another, like running. Hopefully, this article and the sports bra reviews in it will help you out with that. - Should You Do Fasted Cardio to Lose Weight? Some of you might be feeling fine when exercising in your regular bra; you might not feel the need to change it up and get a sports bra instead. What’s so special about them? Well, even if you’re not feeling outright discomfort when exercising in just any old bra, you will still benefit from wearing a sports bra instead – here’s how. Even if you’re just walking, your breasts will tend to bounce up and down, which can cause discomfort or even pain. When you’re exercising, it’s even worse. Good sports bras are made to provide the most support possible when you move and hold your breasts in place. Unlike regular bras, they won’t cause tension in the muscles and will cause you to sweat less. They are good for your skin as well since they don’t leave marks and you can easily take them off at any time. Over time, your breasts will begin to sag, especially if they’re larger. Research has found that lots of movement combined with support that isn’t adequate will lead to sagging sooner rather than later. Wearing a sports bra will help limit the movement of your breasts and provide you with adequate support. When your breasts move, the muscle ligaments connected to them move as well. This can cause pain over time, and sports bras are made to remedy that – they restrict movement and thus reduce the pain. Most women report reduced pain since wearing a sports bra or even no pain at all. Sports bras these days can do much more than what’s their primary purpose. Some are designed to provide additional ventilation and reduce sweat; others have pockets for holding things which are especially popular with runners, and so on. It’s more than just a bra. These days, sports bras have become more than just a functional piece of apparel – they’re a fashion accessory. All the major brands have come out with new sports bra designs meant to look as good as possible. You can see women in sports bras not only at the gym or on the running tracks, but also on the street and in supermarkets. Those are just a few of the many benefits that you can get by wearing a sports bra. But, it’s difficult to shop for a sports bra since the regular bra-shopping conventions that your mother or older friend probably taught you about simply don’t apply. The only thing you need to find the perfect fit for you is to be taught how to do it – so, here we go. Shopping for a sports bra might seem like an outright mystery, but it’s not. If you simply follow a few basic guidelines, you should be able to find the right fit for you even if you’ve never owned a sports bra in your life. Of course, there will be some differences between brands and styles, but this should give you a good starting point. 1. Measure Your Rib Cage: Take a tape measure and put it around your rib cage, just under your breasts. It should be snug but not too tight. Take note of the measurement and round it down to the nearest inch. 2. Find Your Band Size: Depending on the size of your rib cage, find the right band size for you. Here’s a useful chart you can use for that. 3. Measure your Bust Size: Next up, you should take the tape measure and put it around the fullest part of your breasts, making sure the tape stays firm and straight across your back. Not the number and round it up to the nearest inch. 4. Determine Your Cup Size: Subtract the measure of your rib cage from the measure of your bust and compare it to the bust sizes in this chart to find the correct bust size for you. If you happen to be between sizes, round the number up and use the larger size. 5. Measure Your Size Regularly: Women go through at least nine to ten major bra-size changes in their lives, so you should measure your size at least once per year. You might not be the same size now as you were a year ago. Now that you know what size to look for, you’re one step closer to finding your ideal sports bra. However, you still need to consider a lot of other factors when purchasing a bra like this since no two are exactly the same, and they can differ greatly. Here’s what you need to think about. While sports bras are more supportive than regular bras, not all sports bras will offer you the same level of support. You also don’t want the same level of support for all the different activities you might be doing in a sports bra. Low Support: This is what you want for a sports bra you’ll be wearing on a regular day out when you’re just walking or sitting. It will also be the best fit for low-impact activities where you won’t be moving around too much, like weight lifting or yoga. It won’t restrict you too much, but it will stop your breasts from hurting. Medium Support: Sitting somewhere in the middle, this is the type of support that you want if you’re doing something that requires you to move around a bit more than usual. Light jogging, skiing, cycling, rollerblading. High Support: If you’re doing highly intensive physical activities where you move a lot, this is the type of support you want. It’s good for intense running and sprinting, aerobics, rope skipping, rough-terrain biking and more. If you happen to do many different activities, don’t just buy one bra for all of them – buy multiple ones, each with an adequate level of support for the physical activity you intend to do. That way, you’ll always have the optimum level of comfort and support. Not all sports bras are created equal, and even if you find two that have the same level of support, they might not offer you the same type of support. The way a sports bra is constructed and the way it supports your breasts is something you need to consider to find the right one for you. 1. Compression Sports Bras: This is the type of sports bra you most often think about if you’ve never owned a sports bra before. They can be pulled over your head and are made to support both of your breasts at the same time by pressing them against your chest. They have no cups, and they are best suited for activities that have a low or medium impact. 2. Encapsulation Sports Bras: These bras use individual cups and support your two breasts separately. 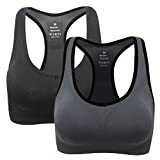 They do not squeeze your breasts against your chest, and they are thus best-suited for everyday activities and low-impact exercises since they offer the best comfort and a more natural look. 3. Hybrid Sports Bras: As the name implies, these sports bras offer a mix of the compression and encapsulation types of support. They are generally best for high-impact physical activities since they offer the best support overall and the best mix of support and comfort. They are not well-suited for everyday wearing though. While good support is paramount for your new sports bra, you should also take a look at more than just that. If your sports bra supports you well, but the straps chafe against you, it won’t do you any good. You should choose the type of strap that best fits your body type and here are the major styles you can choose from. Tank Top: This is the most well-known style of sports bra straps and the most similar to a regular bra. You can usually adjust the straps to fit you better, and they often have back closure as well, allowing for additional adjustment. There are some tank tops whose straps can be crisscrossed as well. Crisscross: As the name implies, these bras have crisscrossed straps. This allows you to adjust them easily and fine-tune how they fit you. If you want, you can easily hide the straps of these bras under a shirt or a tank top, but they look good on their own as well. Racerback: With this type, you have straps that come together between the shoulder blades and create a Y-shape. As you might have guessed, these bras were designed with racers in mind and offer the best support. However, you can’t adjust them so you’ll have to pick carefully. The straps can easily fit behind a tank top. That’s what the different types of straps provide, but here are a few general tips as well. Thicker straps provide better support than thinner ones but might cause you to sweat more. Adjustable straps are good, but they’re usually made of synthetic materials and might chafe or cause you to sweat. When adjusting the straps or picking non-adjustable ones, you should be able to fit two fingers between them and your shoulders – that way they’re not too tight or too loose. These are some of the best sports bras you can get right now, and each one offers its own unique benefits. You’re bound to find at least one that you will love. This is a comfortable bra that fits well, doesn’t chafe and is highly breathable. It also looks quite trendy and comes with pads that, while not of best quality, will be good for some and are removable if you don’t like them. It’s durable, the price is right, and it doesn’t shrink in the wash.
It’s not as supportive as it claims to be though, so you shouldn’t do high-impact activities in it – it’s better suited for low to medium-impact exercises. Best suited for: This bra is the best for women who want comfort over everything else. It is not supportive enough for high-impact activity but it is great for wearing around the house or when taking a walk. The best part about this sports bra is how breathable it is, it dries quickly and doesn’t absorb a lot of moisture so you won’t sweat too much or feel disgusting. It doesn’t chafe either, and it’s highly discreet. The price is great as well, and anyone will be able to afford it. However, it is made out of synthetic materials that might irritate more sensitive skin, and it’s not nearly stretchy enough, so you’re out of luck if you have a larger bust. It also won’t support you too well for high-impact exercises. Best suited for: Women with a smaller bust that do low to mid-impact workouts and are on a budget. If you want a highly discreet sports bra, this one will fit you well too. This is a highly affordable bra that is quite soft and comfortable, comes with good padding and is rather stretchy, so it easily accommodates larger busts. The main issue is that these bras are cheaply made. The material is of poor quality, and it won’t last for more than six months if even that. The padding it comes with is, luckily, removable, since it’s quite poor as well. 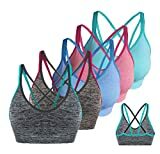 Best suited for: For women that want an affordable but comfortable sports bra, they can wear around the house or for yoga, especially those with a larger bust. Overall, this is a good bra, though you’d expect more from NIKE. It’s a highly supportive and thick bra that is still highly breathable and doesn’t absorb moisture. It stretches well too. One the bad side, it’s a bit too constrictive for doing anything requiring a lot of breathing so cardio is out of the picture. Some of the stitches in the inside can also chafe a bit so be careful. Best suited for: Those of you that are doing a lot of medium-impact exercises and weight training, since the supportiveness of this bra is quite high. This is a sports bra designed for women with a smaller bust, and it’s got moderate support for medium-impact activities. It’s comfortable, lightweight and doesn’t chafe anywhere. However, it is not good for larger busts or cardio. The elastic band also tends to smell after exercise, so it requires a lot of washing. Best suited for: Women who are A to C cups – even the manufacturer says so. It’s also great for doing medium-impact activities or weight training. At this point you know as much as I do about sports bra – still, your pick for the best out of the lot might not be the same as mine, due to different needs and experiences. For me, the best of these bras would be the Champion Absolute sports bra – it just offers the best quality for the price, and it’s exactly what I need. If you’ve got any questions, feel free to comment, and I’ll answer. I’ll see you next time. Related Video: Many women wear sports bras to reduce pain, and physical discomfort. Previous articleShould You Do Fasted Cardio to Lose Weight? The nike sports bra is my favorite!